Tamil Nadu Newsprint and Papers Limited (TNPL) was established by the Government of Tami Nadu during early eighties to produce Newsprint and Printing & Writing Paper using bagasse, a sugarcane residue, as primary raw material. The Company commenced production in the year 1984 with a initial capacity of 90,000 tonnes per annum. 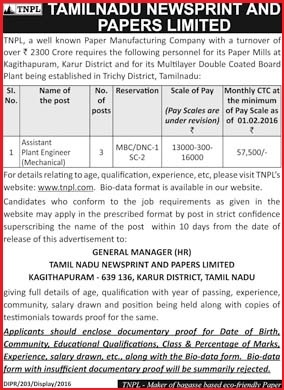 Tamil Nadu Newsprint and Papers Limited announced for various level of Semi Skilled jobs in different Scale of Pay. Interested candidates may apply soon before the last date. For more details like age limit, Educational Qualification, Selection process, how to apply & other information click on the link given below.